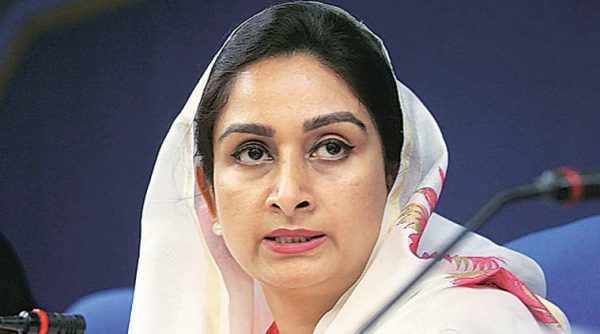 Union Food Processing Minister Harsimrat Kaur Badal today held Congress and AAP responsible for tarnishing the image of Punjab and labeling Punjabi’s as ‘drug addicts’. ‘Drugs in Punjab’ has been a blistering topic for AAP and Congress to undermine the ruling Akali Dal. Speaking to media after inaugurating and laying foundation stones of various development projects, the minister said that Congress and AAP were trying to defame Punjab for political mileage. She also mentioned the failed AAP government in Delhi and Arvind Kejriwal had proved a failed Chief Minister by changing colors like chameleon. The minister said Kejriwal was playing politics of dual standards and he backstabbed the people of Delhi. Hailing the decision of Prime Minister Narendra Modi for approving All India Institute of Medical Science (AIIMS) in Bathinda, the union minister said this prestigious healthcare institute would prove a boon for Punjab and its neighboring states. She also laid foundation stones worth Rs 60 crore of the link roads from Khayal Kalan to Matti, Bhikhi to Daler Singh Wala, Boha to Mal Singh Wala, Barre to Barnala, Boha Saidwala to Bareta and Boha Kurlian to Bareta to Kishangarh. Besides, she also inaugurated newly constructed office of the market committee, Boha, which was constructed worth Rs. 75 lakh. Afterwards, the MP also laid the foundation stone for upgradation of Government High School of Kotla Kalan village to Senior Secondary and Senior Secondary School for Girls Boha. Replying to the query regarding Navjot Singh Sidhu’s likely inclination towards AAP, she mentioned the incident where the former took a dig at AAP leaders by calling them political turncoats. he said AAP leaders had no agenda, vision and stand.